The first College Football Playoff rankings of the 2015 college football season were unveiled this week and there was one big surprise: Alabama sitting at the four spot. Sure, the Crimson Tide are 7-1 and own a couple pretty strong wins but the fact of the matter is this: they lost, at home, to a two-loss Ole Miss team and have not beat a team that currently resides in the Top 25. Even so, Alabama could add a major victory to their resume this Saturday in primetime against LSU. The Tigers have had a pretty surprising season, making waves behind their star running back and Heisman frontrunner Leonard Fournette. Fournette is a 6'1", 230-pound bulldozer of a back that is averaging nearly eight yards a carry on the campaign. The Alabama defense prides itself on it's terrific size and strength up front, led by future NFL studs A'Shawn Robinson and Jarran Reed, but they are certainly going to have their hands full. The key for Alabama will be applying pressure and forcing LSU sophomore QB Brandon Harris to throw the ball. Harris has taken major steps in his development this season but is still far from a proven player at the position. Alabama has proven they will feast on mistakes, which certainly will not bode well for Harris. LSU will also have their hands full, having to contend with the Tide's own stud back, Derrick Henry. Henry himself isn't completely out of the Heisman conversation and he should be the Tide's workhorse in this one. Joining him will be steady Kenyan Drake, who should provide a nice change of pace from the brutish Henry. The key for Alabama's offense will also hinge on their quarterback. Florida State transfer Jake Coker has had his ups-and-downs but seems to get better as the weeks roll on. Coker won't kill anyone with his huge arm but he is accurate and has a great football mind. He also should give LSU some troubles with his underrated scrambling ability, which he will use if necessary. It also helps Coker that true freshman Calvin Ridley has had a huge year, and has proven to be Alabama's No. 1 weapon in the passing game. This game is going to be really, really fun. Neither team is going to break the scoreboard, but the amount of talent and passion on display in this one should be astounding. While both teams are in good position right now, they're eager to really get the signature win and get them over the top. While I think Fournette could still be in store for a big night, I just have too many questions about Harris and the youth on LSU overall. The Tide may just be too much, and also appear to have some luck on their side in the rivalry, considering some of their crazy wins over LSU the past few years. Clemson has had some real success the past couple years under Dabo Swinney's leadership but for awhile there has been one significant bump in the road for the program: Florida State. FSU has won three straight against the Tigers, which have helped them ride the wave to three straight conference championships and higher honors. Meanwhile, many of the losses have been brutal to suffer through for the Tigers, leaving them with a thirst for some vengeance. Now, it appears the tables have turned. Clemson enters this game No. 1 in all of the land, behind a possible Heisman candidate at quarterback and a flaming hot defense, while FSU enters No. 16, with one heartbreaking loss on the year, and some questions on both sides of the ball. Though, Florida State obviously is not going to quit and enters this game still with hopes of an ACC Championship still relatively intact. The Seminoles still aren't completely sure on who their quarterback is going to be entering this game. Sean Maguire led the 'Noles to a victory in the matchup a year ago and has looked good when stepping in for Everett Golson this season. But, Golson, a Notre Dame transfer, has more experience in big games and has shown a good command of the offense. Whoever starts for FSU will be happy to have sophomore back Dalvin Cook by their side. Cook has put together a huge season after a long and tumultuous offseason. Cook is a quick and deceptive runner, but the Clemson defense has been surprisingly strong all year. Sure, the Brent Venables-led unit was expected to be pretty good but it suffered severe losses this offseason and has looked much more disciplined and stronger than expected. One thing is for sure for the Clemson defense: end Shaq Lawson should be in store for a big game, especially with the Florida State offensive line a little bit banged up. 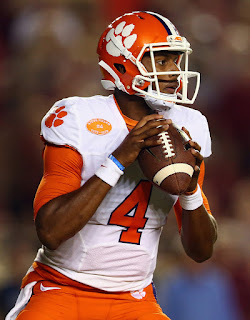 The Tigers have been rolling offensively as while and will bring sophomore quarterback Deshaun Watson to the table. Watson had somewhat of a slow start to the year but has been absolutely dominant the last few games. Florida State's secondary is no slouch, but they should be in for a tough game against Watson. Up front, the Seminoles will also be prepared, as Watson is a proven runner. Clemson's ground attack has been rolling as while, behind powerful Wayne Gallman. His great running has given the Clemson offense crazy versatility. Swinney's program has been too often criticized for losing games they shouldn't and letting close ones slip away. If they truly have changed and are truly the best team in the nation, there is no better team to prove it against than the Seminoles. If FSU can't completely slow done Watson, no matter what Cook does, they are going to have a tough time in this one. Late last season, TCU was shocked when they were left out of the inaugural College Football Playoff. Despite a 50-plus-point barrage of Iowa State, they had dropped six spots in the polls and were left to play a meaningless Peach Bowl game (which they went out and won by 39). The Playoff Committee didn't exactly show them much respect in the first polls this season either, ranking them down at eight, below two one-loss teams. Though, you can definitely argue TCU's resume is far from impressive, which is why this meeting with undefeated Oklahoma State is so big. The Cowboys have been a relative surprise, but they haven't exactly played much either. Even so, it has still been impressive how well the offense has played under the two-quarterback system of Mason Rudolph and J.W. Walsh. Both are mobile quarterbacks with big arms who should definitely test an extremely young Horned Frogs' defense that has already had some rough moments. Though, that defense does still have senior safety Derrick Kindred, the leader of the defensive unit. Kindred is a ball hawking defensive back who should play a big role in this one. Defensively, Oklahoma State has also been somewhat of a revelation. They haven't been absolutely shutting down opponents, but they have shown solid progress this year. It definitely helps that defensive end Emmanuel Ogbah has been one of the nation's bests, already with nine sacks on the year. That Oklahoma State defense hasn't faced a test like TCU yet, though. Senior QB Trevone Boykin has been scorching hot all year, along with his favorite target, fellow senior Josh Doctson. While Boykin's big arm and speedy playmaking abilities have made him a Heisman candidate, Doctson's insane numbers have made him the Biletnikoff Award frontrunner (given to the nation's best receiver). The Cowboys' secondary is still incredibly youthful and they will also get their hands full with Kolby Listenbee, a proven deep threat, and exciting KaVontae Turpin. Aaron Green, TCU's running back, has also put together a solid year and only adds to the list of playmakers Ok. State will have to contain. Even so, Mike Gundy's team should out well prepared in this one. TCU has won a number of close ones, but it is hard to see just how good they truly are. If their defense struggles and Oklahoma State can force some turnovers, the Cowboys could have a very strong shot at playing an upset. Even so, I like TCU in this one. Oklahoma State's defense may just be too young to completely shut down TCU, and I think the Horned Frogs defense can play well. I'm picking TCU in a close and exciting shootout, although traveling into to Stillwater will be no easy business.